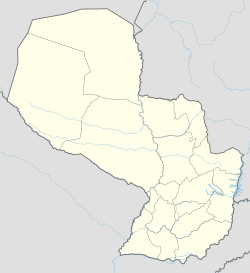 Lambaré (Spanish pronunciation: [lambaˈɾe]) is a city in Central Department, Paraguay, part of the Gran Asunción metropolitan area. With a population of approximately 140,000 inhabitants, it is the sixth-most populous city in the country. The name of the town derive from the Guarani language Ambaré, "the land of shadows". The people were known as avambaré, citizens of El Ambaré. This Paraguay location article is a stub. You can help Wikipedia by expanding it. This page was last edited on 18 January 2019, at 14:02 (UTC).